Australian High Commission Supports Caribbean Civil Society Cervical Cancer Prevention, the Healthy Caribbean Coalition (HCC) has been awarded a grant by the Australian High Commission Direct Aid Program to fund a multi-country cervical cancer prevention initiative aimed at building the capacity of key Caribbean civil society actors to respond more effectively to the community-based needs for cervical cancer prevention, treatment and control. 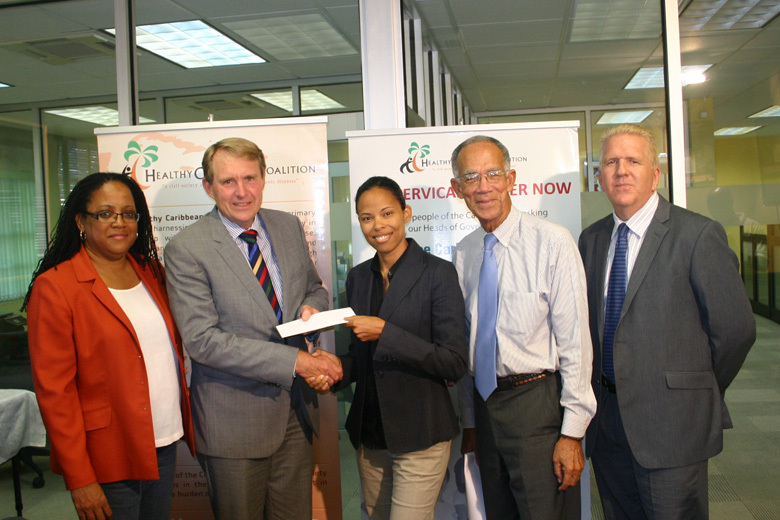 At the HCC offices on Friday November 29, 2013, Ambassador Ross Tysoe presented a check to the HCC for $112,800.00USD to fund five regional projects. The project will be implemented across five OECS countries. The recipient organisations and countries are as follows: The Belize Cancer Society (BCS), Belize; The Dominica Cancer Society (DCS), Dominica; The Grenada Cancer Society (GCS), Grenada; The Cancer Institute of Guyana (CIG), Guyana; and The Jamaica Cancer Society (JCS), Jamaica. Professor Trevor Hassell, President of the HCC, in thanking Ambassador Tysoe remarked that ‘This project exemplifies the role of the HCC as an organization building the capacity of regional CSOs by adding value to their daily operations and directly impacting the achievement of their respective organisational missions.’ HCC Manager, Maisha Hutton, added ‘The HCC is proud to assist member NGOs in this buy tramadol overnight free delivery critical area of cervical cancer, through novel efforts aimed at reaching traditionally underserved women’. Every year, over 500,000 women develop cervical cancer globally. In the Caribbean 2,245 women die of cervical cancer each year; this translates to approximately 6 women dying every day – entirely unnecessarily. The Caribbean is among the top four highest sub-regions in the world with respect to thess incidence of cervical cancer and has the highest burden of HPV in the Americas. Cervical cancer is the second leading cause of death among Caribbean women with death rates several magnitudes higher than countries such as the USA. More than 95% of cases of cervical cancer can be prevented. This requires widespread awareness, increased screening and effective prevention and control measures that include Pap Tests, HPV testing, VIA (visual inspection using acetic acid) and vaccination against HPV. A C4PI project page is under construction and will be live soon, allowing you to follow progress under this initiative. For more information about The Direct Aid Program please visit the website here.